Once upon a time, no one knew what an infographic was. Today, that’s changed – they’ve become one of the most powerful content marketing tools at your disposal. They can provide significant value to your audience, and they have considerable potential to go viral if done well. Obviously, you need to create compelling infographics for that to happen, though. Here are some of the most important tips for doing just that. It’s vital that you avoid the temptation to throw too much data at your readers. Your infographic should have a relatively narrow focus based on relevant, factual data. For instance, if you were creating an infographic to help promote a new running shoe, relevant points to include could be sole design, breathability, material durability and support, to name just a few. Simply put, you cannot afford NOT to use a professional designer for creating your infographic. You can supply the data, the inspiration and information, but you need someone with good skills to put it all together and to add graphic elements. If you don’t have someone capable within your organization, look to outsource this, but don’t settle for anything less than professional quality. All infographics should tell a story. It might be the growth of content marketing, or the rise of small breweries. It might be the buy local movement and the growth of “owner operator” stores in your immediate area. Whatever it is, make sure that your story comes through loud and clear, and that all your data points support that story. 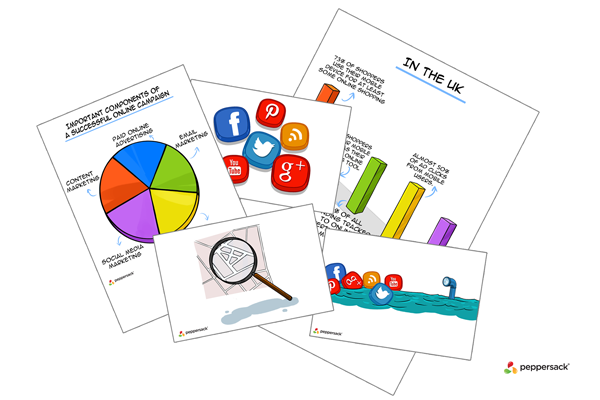 This cannot be stressed enough – you MUST use accurate information in any infographic. Imagine the repercussions if your content were to go viral, only to find out later that some of the information it included was inaccurate? It’s impossible to estimate the damage this could cause to your brand. While you need to focus on ensuring that the design is clean and clear, and that your data tells the story you want, you cannot neglect to brand your infographic. That means ensuring that it ties into your company’s culture, as well as featuring not only your business name, but other information, such as your website and email address (preferably hyperlinked so that readers can click to visit). Let’s be clear about one thing – your infographic is not text. It’s an image. That means search engines can’t index it. How do you ensure that it’s visible to the people who need to see it? The answer is to write a description, maybe even a blog post, that’s optimized with relevant keywords. Make sure you include “infographic” as one of those keywords, as well. Infographics are powerful tools that can do a lot for your content marketing efforts, but they need to be done right. An incorrectly created infographic can do more harm than good, and will definitely cost you in terms of visibility and even reputation.